A wild season deserves a wild tournament. After a chaotic regular season in men’s college basketball — during which 18 separate teams ranked among the AP’s top 5 at various points — it’s finally time for the real Madness to begin. 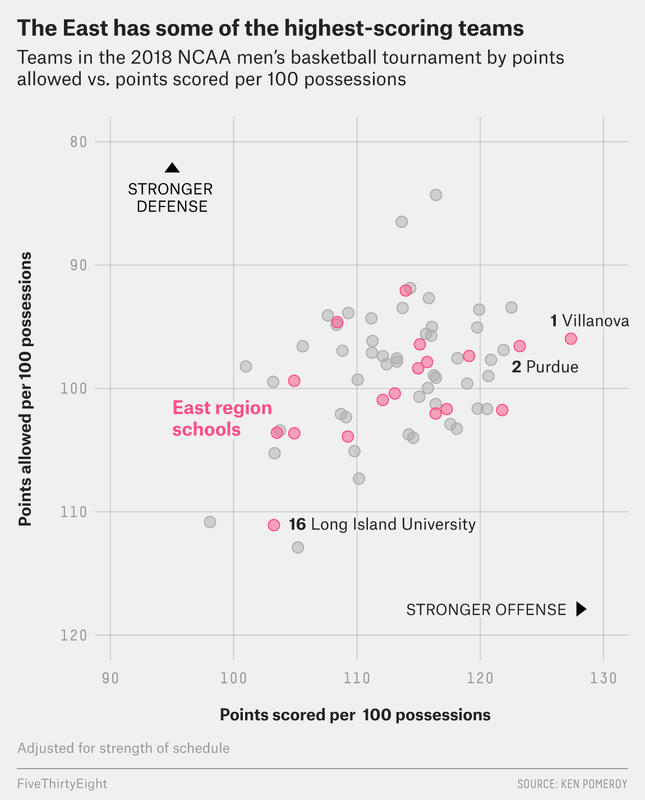 And that means we’re breaking out the FiveThirtyEight NCAA Tournament model to help you make all of your bracket picks, as always (you can read about how the system works here). Below I’m highlighting the key teams and matchups to watch in each region, including dark horses and cinderellas who could bust up the bracket. With overall favorite Virginia only boasting an 18 percent chance of winning it all, this year’s Big Dance should be as crazy as ever. Favorites: According to the FiveThirtyEight model, top seed Villanova has the best chance of advancing to the Final Four in the entire field, with a 50 percent probability of winning the East. The Wildcats are an exceptionally strong offensive team, with guard Jalen Brunson leading ‘Nova to the nation’s top efficiency mark in Ken Pomeroy’s ratings during the season. But their 22nd-ranked defense is no slouch either, spearheaded by do-everything wing Mikal Bridges. The only thing keeping Villanova from being our overall favorite is the way the bracket has situated the East region on the same side as the Midwest, which contains three of the top eight teams in the field according to our power ratings. No. 2 seed Purdue has the potential to make some noise, but a tough matchup with Texas Tech or Florida could loom in the Sweet 16 — if the Boilermakers make it past likely second-round opponent Butler first, that is. (More on the Bulldogs later.) Purdue’s difficult path is a big reason why it has only a 20 percent probability of making the Final Four, which ranks last among No. 2 seeds. Dark horse: Underseeded at No. 5, West Virginia ranks 11th in our power ratings and could be a team to keep an eye on. 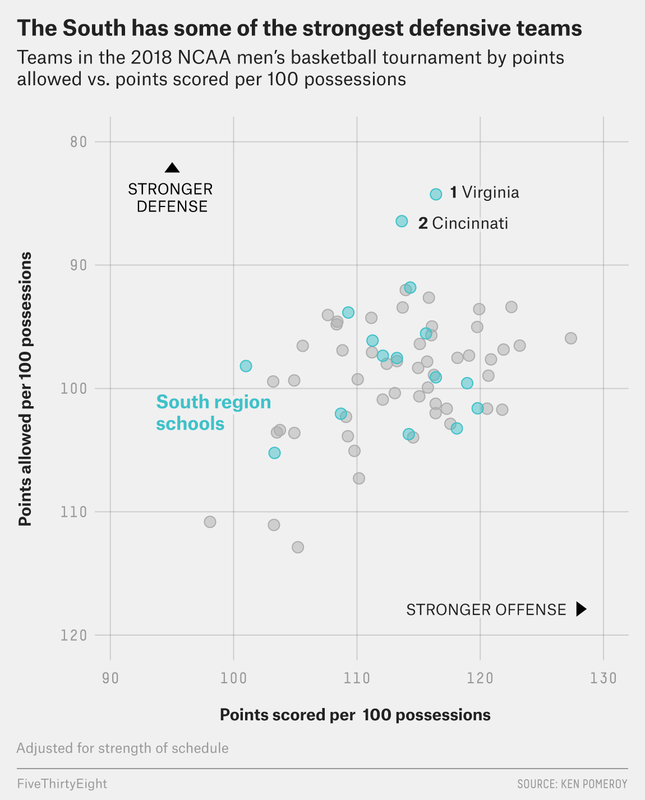 The unfairly low seed means the Mountaineers will potentially have to unseat fourth-seeded Wichita State (always a tough out) and Villanova in back-to-back games, but West Virginia is a constant threat with its swarming, turnover-inducing defensive style. Even though WVU might have peaked too early with its terrific run around New Year’s — it has lost nine of its last 18 games — don’t count out Bob Huggins’s crew just yet. Don’t bet on: No. 3 seed Texas Tech. The Red Raiders are a fine team that plays some of the nation’s stingiest defense, but they’ll probably have to make it through an unusually strong No. 6 seed (Florida) in the round of 32 just for the right to face Purdue (or possibly Butler). Our model only sees a 6 percent Final Four chance for Texas Tech, easily the worst mark for any No. 3 seed. Cinderella Watch: Slotted in as the No. 10 seed by the committee, Butler probably deserved better. We have them ranked as the 23rd-best team in the field, thanks in large part to an offense that sits at No. 32 in the nation according to Pomeroy. The Bulldogs should be solidly favored (60 percent) over Arkansas in round one, and they could give Purdue trouble in the next round. Likeliest round-one upsets: Butler over Arkansas (60 percent); Alabama over Virginia Tech (41 percent); UCLA* over Florida (39 percent). The second co-favorite out of the Midwest is — sigh — Duke, at 29 percent. The Blue Devils lost some close games down the season’s final stretch. But none were by more than 5 points, and they were one of only two teams in the country to rank among Pomeroy’s top 10 in both offensive and defensive efficiency. (The other? No. 3 seed Michigan State. Again, the Midwest is stacked.) Rooting against Grayson Allen and Co. will once again be a top springtime ritual for most of America, but barring, say, something special from Oklahoma’s Trae Young,1 Duke might not have much trouble until the Sweet 16. There, the Blue Devils might have to face Michigan State, our third co-favorite. Sparty is solidly No. 3 in the pecking order with 25 percent Final Four odds, but that’s also easily the highest of any team seeded lower than second in the entire bracket. This is your classic strong all-around Tom Izzo squad, with four players — Cassius Winston, Miles Bridges, Jaren Jackson Jr. and Nick Ward — who ranked among the Big Ten’s top 16 in Win Shares according to Sports-Reference.com. MSU and Duke’s potential Sweet 16 showdown is the game everyone is already circling in the second week. Dark horse: Because of how strong its top-line teams are, the Midwest doesn’t really lend itself to dark-horse bids. But if you had to pick one, Auburn might be the one to emerge from the field. Led by the undersized trio of Mustapha Heron, Bryce Brown and Jared Harper, the fast-paced Tigers should be entertaining regardless. Auburn will probably have to tangle with a strong Clemson team in the round of 32, however, before potentially running through the gantlet of all those favorites listed above. Fun or not, that is why our model sets Auburn’s Final Four odds at a measly 3 percent. Don’t bet on: Sixth-seeded TCU. The Horned Frogs rank 22nd in Pomeroy’s ratings and enjoyed one of their best seasons in decades under coach Jamie Dixon. But no matter whether Syracuse or Arizona State wins their play-in game, they’ll give TCU a tough game in the first round — and it only gets harder from there, with Michigan State likely waiting in the wings. A deep run by the Frogs, playing in their first tournament since 1998, doesn’t appear to be in the cards this year. 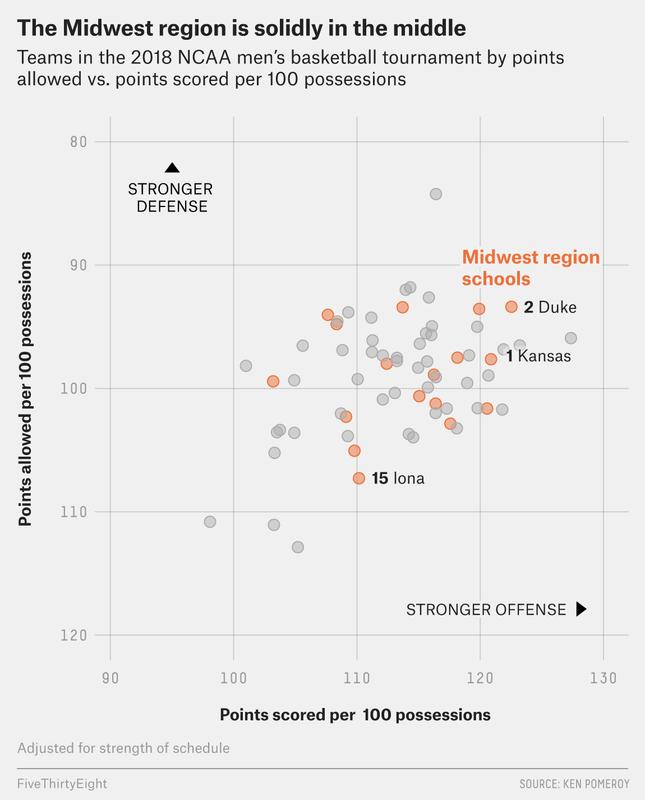 Cinderella Watch: Of all the Midwest’s double-digit seeds, No. 12 New Mexico State is most likely to find itself playing with the big-name programs on the tournament’s second weekend. The Aggies won 28 games this season and had the nation’s 14th-best defense according to Pomeroy. Our model thinks they have a fighting chance (38 percent) against Clemson and gives them an 18 percent chance of sneaking into the Sweet 16. Favorites: The West is probably the weakest of all the regions in this year’s bracket. Its top seed, Xavier, ranks as only the 10th-best team in the country by the FiveThirtyEight power ratings — which would typically only fetch a No. 3 seed. The Musketeers are plenty good on offense, but a defense that ranked just 59th in Pomeroy’s ratings is among the reasons why our model assigns them only an 18 percent chance of making the Final Four, by far the worst of any No. 1 seed in the bracket. In fact, our projections say the West’s most likely Final Four team is the defending champion, North Carolina, which has a 25 percent probability of advancing to San Antonio despite getting a No. 2 seed from the committee. The Tar Heels had something of an up-and-down season, losing 10 games (including seven in conference play), but they looked solid in the ACC tourney and boast one of the country’s deadliest two-man scoring combos in Joel Berry and Luke Maye. Then there’s fourth-seeded Gonzaga, last year’s national runners-up, which also checks in with a better Final Four probability (24 percent) than Xavier. The Zags were badly underseeded here — we have them ranked ninth in the country by power rating — and their draw could have them set up for a very deep tourney run. According to Pomeroy, the Bulldogs were one of only three teams in the nation (alongside Duke and Michigan State) whose offense and defense each ranked among the top 20 in efficiency. 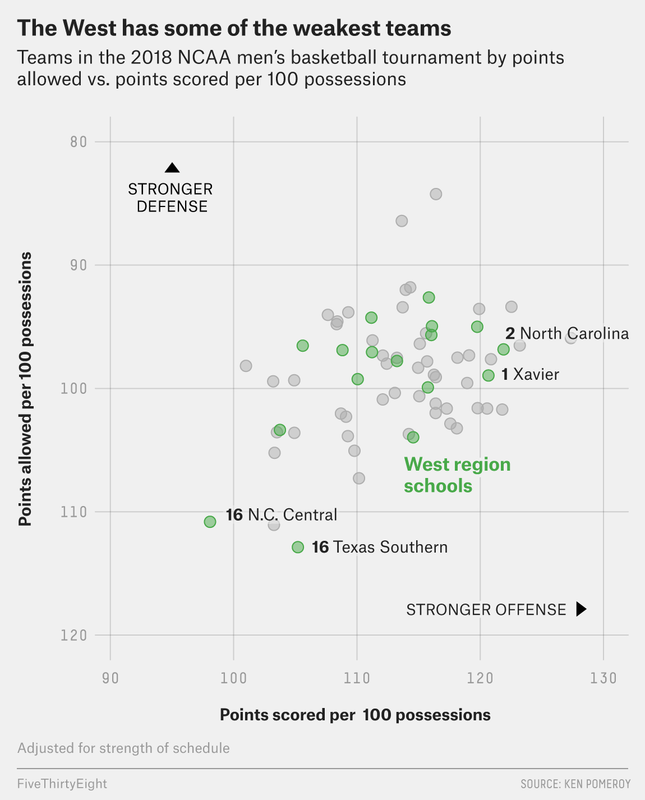 Dark horse: Does Gonzaga count here? If not, and you’re looking for a sneaky Final Four bid out of the West, look no further than sixth-seeded Houston. The Cougars pushed Cincinnati to the brink in the American Athletic championship game Sunday, showing a national audience just how stifling this team’s defense can be. Houston is a solid favorite to beat San Diego State in round one; in Wichita, they’d also be playing comparably closer to home against Michigan in round two. From there, UNC likely awaits, but our model gives the Cougars a 33 percent chance of getting that far — and, as a result, a 7 percent chance of making the Final Four. Don’t bet on: No. 3 seed Michigan. It’s an unfortunate draw for a team heading into the tourney playing as well as just about anybody in the country (the Wolverines actually rank third in our pre-tournament Elo ratings, behind only Virginia and Villanova), but the selection committee did Michigan zero favors here. First-round opponent Montana is unusually strong for a No. 14 seed — check out the sea of 10, 11 and 12 seeds around them in Ken Pomeroy’s rankings — and likely second-round foe Houston was underseeded as a No. 6, too. Then, if the Wolverines survive opening weekend, they’ll probably be treated to a rematch of their 15-point loss to UNC from late November. Michigan has fought through similarly tough tourney paths before, but right now we give them only a 14 percent shot at a Final Four berth. Cinderella Watch: Sadly, this isn’t a very promising region for Cinderella bids. For instance, No. 11 seed San Diego State is the kind of good, solid team (it ranks 50th in Kenpom’s ratings) that you’d ordinarily pencil in for an upset or two, but Houston and Michigan are too difficult to realistically expect a Sweet 16 berth from the Aztecs. And the other teams in classic upset seeds — 10th-seeded Providence and 12th-seeded South Dakota State — are each the weakest at their seed-line in the whole field. Blah. Favorites: After a storybook 31-2 regular season, Virginia is a 47 percent favorite to make the Final Four out of the South — and an 18 percent favorite to win the whole tournament, tops among the entire field. You’ll hear a lot this month about how the Cavaliers play basketball: Yes, they’re painfully slow and they grind teams to a pulp with their defense. Yes, those kinds of teams have some history of coming up short in the postseason. These are questions Virginia must answer. But you have to give the Cavs credit: This is also a team whose only blemish in its last 24 games was a 1-point overtime loss. On paper at least, Tony Bennett’s team is set up well to silence its doubters this year. If that doesn’t happen, Cincinnati might very well be the reason. The second-seeded Bearcats are the fifth-best team in the country according to our power ratings, so they’re nearly top-seed-worthy in terms of quality. More importantly, they also play a similar style to Virginia — taking the air out of the ball and fighting every defensive possession to the bitter end — so a matchup between the two would be fascinating. We give Cincy a 53 percent chance of making the regional final and a 23 percent probability of pushing its way into the Final Four. Dark horse: Laden as Kentucky perennially is with top recruits, we used to ask whether it was fair to slap the “dark horse” label on the Wildcats. But the SEC champs do seem to have perfected a certain formula under coach John Calipari: enter the season ranked highly, struggle around midseason, and then pour it on late in the schedule and slip into the NCAA tourney as a so-so seed before making a deep run through the bracket. This year’s squad has all the earmarks — from a No. 5 preseason ranking and a four-game February losing streak to an impressive run through the SEC tourney. Our model knows this kind of team, and it gives a little extra credit to highly touted preseason squads with inconsistent regular seasons. It’s no coincidence that we’re giving the Wildcats a solid 7 percent chance at making the Final Four. Don’t bet on: Fourth-seeded Arizona. Was the NCAA doling out early punishment for the Wildcats’ alleged recruiting scandal with this draw? The committee stuffed Arizona into a first-round matchup with Buffalo, which our power ratings easily consider the strongest 13-seed in the bracket. If they win, the Wildcats will then have to play either Kentucky (see above) or a dangerous Davidson team that easily rates as the strongest No. 12 seed in the bracket. And that’s just leading into a potential Sweet 16 matchup with No. 1 overall seed Virginia. Arizona big man DeAndre Ayton might be the best player in the country — he leads all major-conference players in Win Shares this season — but the odds of us seeing much of him in the tournament aren’t very high. Cinderella Watch: Keep an eye on No. 11 seed Loyola-Chicago in this region. We give it a 40 percent chance of knocking off an overseeded Miami squad in the opening round of the tourney, and it wouldn’t have terrible odds against Tennessee in round two, either. Of course, Loyola would have an even better Sweet 16 shot if there were any chance the No. 3 seed Volunteers would lose in round one, but Tennessee’s first-round opponent, Wright State, is worse than two No. 15 seeds and a No. 16 seed. Assuming the Sooners can pull out of their death spiral long enough to win their first game.